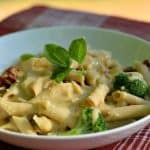 If you love a thick, cheesy, Alfredo Sauce, then you have GOT to try my Vegan Garlic Alfredo with Sun-Dried Tomatoes. Thick, cheesy, decadent Alfredo – with absolutely NO added fat of any kind. That’s right…..NO cashews in THIS sauce. Read on to discover my secret ingredient. This recipe really should never have happened. Seriously. I had JUST published my Vegan Portabella French Dip recipe and had absolutely NO plans on even COOKING that night, let alone releasing a new recipe. But, the girls had been gone all day, and I knew they’d be hungry…..and ‘I‘ was hungry, so I literally just started grabbing ingredients and threw this together at the last minute. They say that’s where some of our best recipes come from…..and I think my family would agree. My wife absolutely LOVES this Vegan Garlic Alfredo, and to put it in young people’s language…..my 30yr old daughter said, and I quote…. SO I guess it’s really good….. But what’s wild about this sauce – which is what really makes this dish by the way – is that there is no added fat of any kind. And no nuts ….. not even cashews. I was thinking pasta would be a simple, easy dinner that night, so I grabbed an 8oz box of Spelt Penne my wife had just picked up from the store and set it aside. I’d cook it once I figured out the sauce. I knew I wanted a garlic sauce, so I took 6-8 large garlic cloves and minced them. I used 8 cloves – but I REALLY like garlic – so adjust according to your own individual taste. Use a tablespoon of veggie broth as needed to prevent sticking. I also chopped up about ¼ of a medium white onion and added that to the pan with the garlic. Sauté the veggies until just softened. Now the base for the sauce was going to be the tricky part – as most vegan bloggers would have already pre-soaked a bunch of cashews. 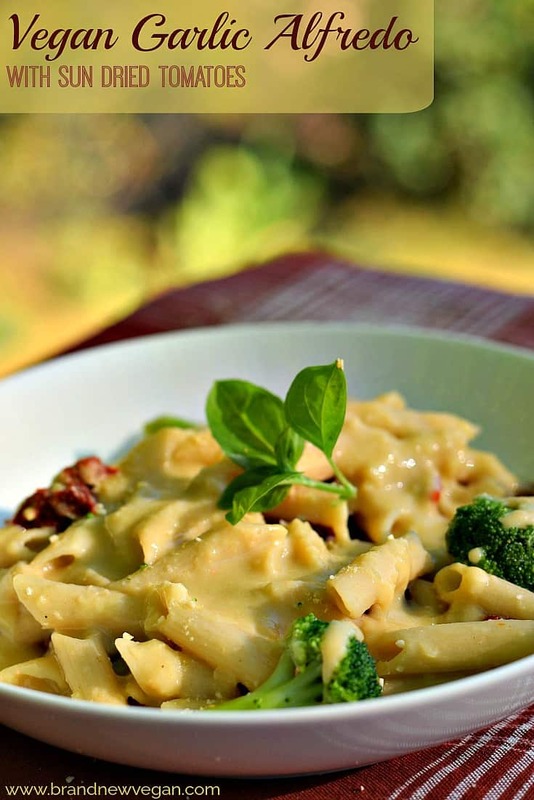 Cashews DO make a creamy sauce, but I didn’t have any soaking, AND I know a lot of my readers are watching their fat intake…. So what else could I use besides cashews? I looked in my pantry and instantly saw something that might work. I have used them before in making my Vegan Potato Salad and Vegan Pasta Salad Dressing…. so maybe, just maybe, this can of White Beans would make a good base for my Vegan Garlic Alfredo Sauce. I opened a 15oz can of S&W White Beans (I’m pretty sure any small white bean would work… navy, great northern, etc) and dumped the whole can into my blender, juice and all and gave it a whirl. Now add the sautéed garlic, onions, 1 cup of Unsweetened Almond Milk, 3 Tbs Flour, 1 Tbs Lemon Juice, and ¼ cup Nutritional Yeast and blend until very smooth. Pour the Alfredo Sauce back into the pan and simmer over low heat until it just begins to thicken. Finally, to add a little saltiness, and a little bit of Umami (savory taste)…… I whisked in 2 tsp of Yellow Miso. 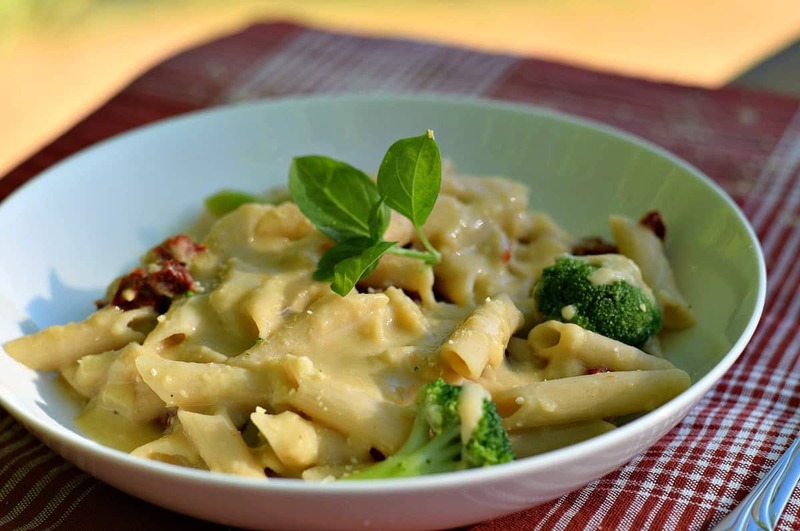 A very simple Vegan Garlic Alfredo Sauce – without any added fat…. and it tastes pretty gosh darn DELICIOUS if I do say so myself! At this point, go ahead and prepare your pasta according to the package instructions. Just before the pasta is finished cooking, remove it from the heat, drain, and place it back in the pan with about ½ cup of Sun Dried Tomatoes (look for the dried ones, not packed in oil). Stir in some cooked broccoli optional but good) and about 2 cups of the Vegan Garlic Alfredo Sauce. Mix thoroughly. Garnish with Vegan Parmesan and any leftover Alfredo Sauce and serve. 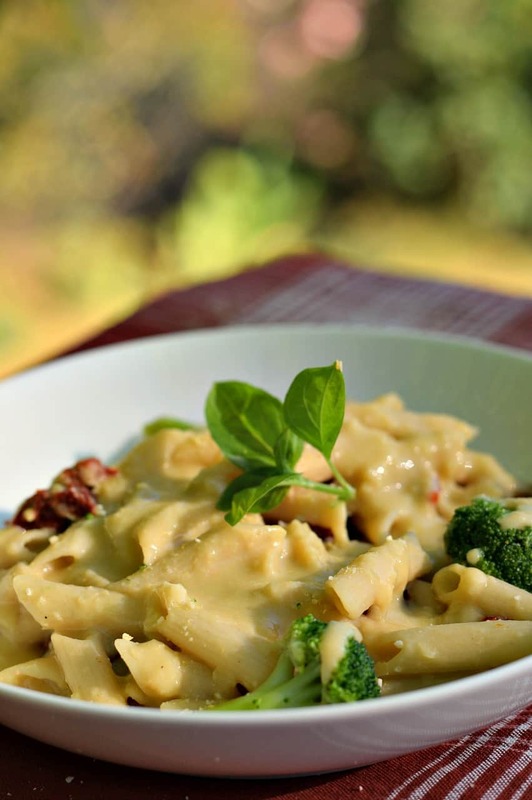 This rich, decadent, nut-free Vegan Garlic Alfredo will surprise you with its secret ingredient. Who knew Alfredo could be so creamy without any added fat? Mince and chop garlic and onion and saute in veg broth until softened. Add beans and their liquid to blender and puree until smooth. Pour blended Alfredo Sauce back into the pan and simmer on low heat until thickened. Remove sauce from heat and whisk in miso paste until smooth. Prepare pasta according to package instructions. Drain and return to pan. Stir in tomatoes, broccoli, and about 2 cups of Alfredo Sauce and stir to combine. Serve and garnish with additional Alfredo Sauce and Vegan Parmesan. O wow! If I wasn’t on a road trip I would be in my kitchen making this immediately!! Looks delicious Chuck!! Try putting a pinch of nutmeg in this sauce. This pasta recipe looks really interesting. Just a comment. The first thing I saw when I clicked on your site, was an ad for Tysons. Disturbing when clicking on a vegan recipe. You’re lucky. When I clicked on to reply today up popped two Tyson’s ads. One on the bottom of the page and one on the side. Ads are usually personalized according to your own search history. I don’t see Tyson ads either. I see ads for jewelry that I was looking at earlier. This looks amazing and will be printed and tried. Thank you so much!! What a unique approach to a creamy sauce. Love it. Made this today. OMG delicious! Can you freeze the sauce? Brilliant idea for another version of creamy sauce for pasta – who would have thought of white beans??. In South Africa nuts are extremely expensive so the white bean version is the BOMB!! Thanks for the excellent post = please keep them coming!!! How much sauce does this make? The recipe is on my menu this week and I’ll be doubling the pasta, do I need to double the sauce? Looks fabulous! I have some smoked sun dried tomatoes that I think will be crazy good. We made a double recipe for 1 lb of penne pasta and it was enough for 4 very hearty appetites served with a green salad. Hmm… I think I want to try this sauce as a base for a WFPB pizza! You have a culinary gift. Thanks for sharing it with all of us. We made this for non vegan company last evening and it was marvelous! Lots of ingredients but comes together easily and was rich,thick, creamy and delicious. We inadvertently left out the miso and didn’t miss it. Delicious s. Received husband’s seal of approval. Highest award possible in our house.